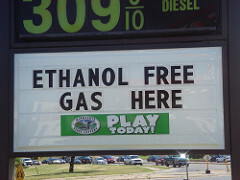 Is The Epa Cracking Down On Ethanol? Yes And No. There was pretty big news on biofuels yesterday, but first, a little background: Back in 2007, Congress passed a bill that mandated an increase in biofuels production, to 36 billion gallons per year by 2022. There was a catch, though: Since a lot of researchers have been arguing lately that corn-based ethanol actually emits more greenhouse gases then regular old gasoline, the law made a few concessions to environmentalists. Namely, it said that corn ethanol had to emit 20 percent less climate pollution than gasoline. And it was the EPA's job to figure out how to measure that. Anyway, the EPA finally released its proposed rule yesterday, and surprisingly, it decided to consider the indirect land-use effects of ethanol. For those who haven't followed this issue, indirect land-use has been the source of much contention. A lot of studies, like this landmark report in 2008 by Tim Searchinger et. al., have found that when you pull corn out of the world's food supply in order to make fuel, that causes farmers in developing nations to cut down rain forests to plant their own corn. As a result, corn- and soy-based ethanol do far more damage to the climate than burning gasoline does. The ethanol industry insisted that indirect land-use analysis was still too fuzzy to draw any firm conclusions, but the report was a big deal, and impossible to ignore. Under the EPA's proposed rule, corn- and soy-based ethanol would, in many cases, not meet the emissions standards over their life cycle—because of the effects of land use. By contrast, cellulosic ethanol grown from, say, switchgrass or stovers will pass. (By law, these fuels have to emit 60 percent fewer emissions than gasoline—although there's some contention about whether even switchgrass ethanol, if it ever became commercial, might cause the same indirect land-use effects if, say, the switchgrass was planted on farmland instead of crops.) If you're curious, Tom Philpott has even more in-depth analysis. Still, this could turn out to be the beginning of a long-overdue crackdown on biofuels that indirectly cause more harm than good—especially since it comes on the heels of a California standard that did much the same thing. So we'll have to see how the EPA rulemaking unfolds, and whether the agency can withstand what's likely to be heavy lobbying. Either way, though, there's no sense weeping for the ethanol industry. It's still getting a barrage of tax breaks and new R&D money coming its way—a lot of it from the Energy Department to help research the next generation of biofuels (like fuel from algae, say).